Level Edits to levels 46, 49, 52, 54, and 55. The pause menu now shows how many blocks remain (beside the pie chart which shows the percentage). Fixed level 21 HUD timer location. Manual jump direction moved slightly upwards. Fixed windows 7 menu bug with constant input. Reduced the brightness of a block on level 15. Improved data correction for incorrect save files with less than 55 best times. Spectrum Break just released on Steam! You can buy Spectrum Break now on Steam for $9 USD. Spectrum Break releases on Steam tomorrow! I am so hyped. 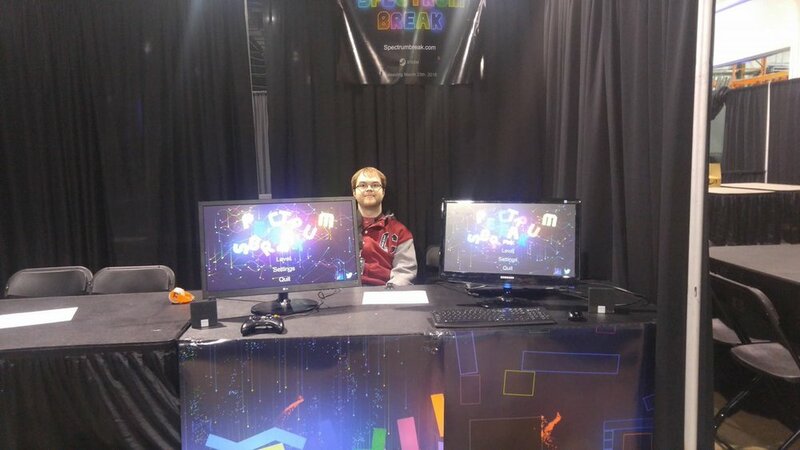 Check out Spectrum Break's steam page at 1pm EST tomorrow. Had a Great Time at EGLX! Skypypre Studios with my friend Braiden and I.